The Rolex GMT-Master “Pepsi” has been around for a long time. In fact, the very first GMT-Master made its debut in 1955. As many of us know, Rolex created the GMT-Master specifically for commercial airline pilots to keep track of two time zones simultaneously. It was truly a tool watch that served a practical purpose. Six decades later, the appeal of the GMT-Master (and subsequent GMT-Master II) watches have gone well beyond the pilot community. In addition to regular Rolex fans around the world, the GMT-Master Pepsi is also a favorite of high profile celebrities. Join us as we play a game of celeb watch spotting! The Rolex Pepsi is a watch with a long history and has been seen beyond the aviator’s community. In the Rolex community, the “Pepsi” nickname refers to the iconic blue and red bezel available on the GMT-Master and GMT-Master II watches. Blue and red were the colors of the inaugural GMT-Master and many, many models after that. Not only did the two colors look great, they have a practical application too. The red area on the bezel represents daylight hours and blue is for night hours. The Rolex GMT-Master II bezel has a few variations. While there have been several other GMT-Master bezel color options including black and red, bronze and brown, and solo black, the blue and red Pepsi is still the top choice. The only GMT-Master II Pepsi model currently available in the Rolex catalog is the 18k white gold GMT-Master II ref. 116719 BLRO. The white gold makes that particular model out of reach for many. However, thankfully there are still plenty of discontinued and vintage stainless steel GMT-Master Pepsi watches to choose from. From television personalities to movie stars to professional athletes, there are many celebrities that count themselves as fans of the Rolex GMT-Master Pepsi. Which Celebrities Wear a Rolex GMT-Master Pepsi? British actor Daniel Craig is best known for his roles in the current James Bond movies. While James Bond now officially wears OMEGA watches (after decades of wearing Rolex watches) Daniel Craig himself has several Rolex watches in his personal collection. And amongst them is a GMT-Master II with a Pepsi dial. Another Hollywood leading man with a penchant for Rolex is Orlando Bloom. He especially likes vintage Rolex models, such as the GMT-Master ref. 1675 with a Pepsi bezel we’ve spotted on his wrist. Unfortunately, Orlando Bloom was the victim of the “Bling Ring” where he had several very expensive and rare vintage Rolex watches stolen from his home. It’s been reported, however, that some, if not all, of his stolen Rolex watches, were eventually returned to him. Another proud owner of the vintage stainless steel Rolex GMT-Master ref. 1675 with a Pepsi bezel is professional baseball player, Howard Kendrick. The left fielder for the Philadelphia Phillies is a well-documented watch geek as illustrated by his beautifully curated collection pictured on his Instagram feed. 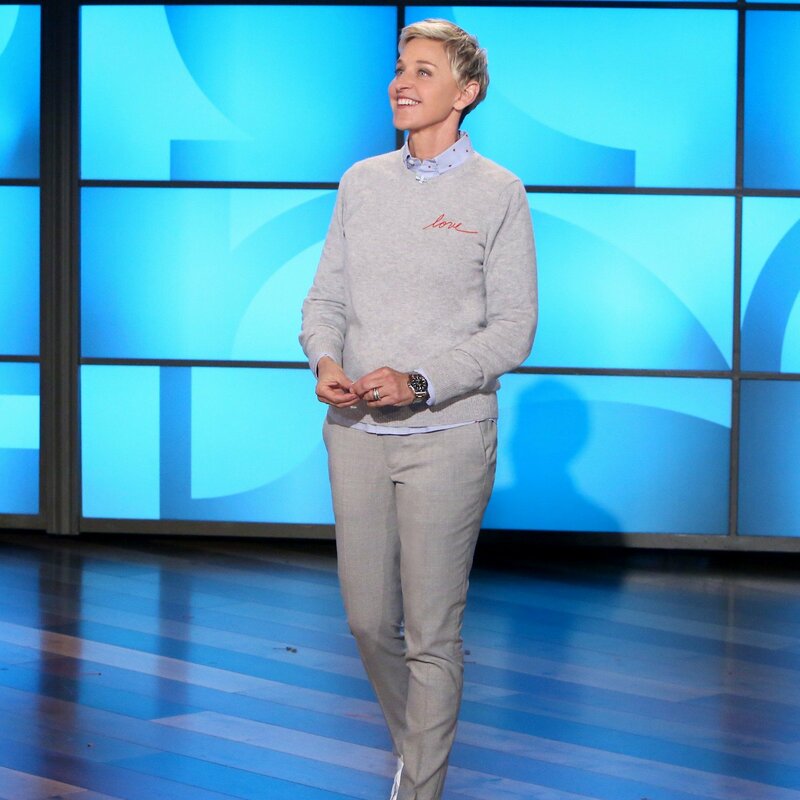 Comedian and host of her own daytime tv show, Ellen DeGeneres, is also a serious Rolex collector with several coveted pieces—such as Daytona Paul Newman chronographs—to her name. Her Pepsi Rolex is none other than the 18k white gold GMT-Master II ref. 116719 BLRO we mentioned previously. Speaking of ultra-precious, Sylvester Stallone’s Rolex Pepsi is the GMT-Master II ref. 116759 SARU. Rather than an acrylic bezel or even a Cerahcrom ceramic bezel, Sly’s Rolex sports a jeweled one. The 18k white gold GMT-Master II boasts diamonds, sapphires, and rubies on the bezel that come together in the famous blue, red, and white combo. 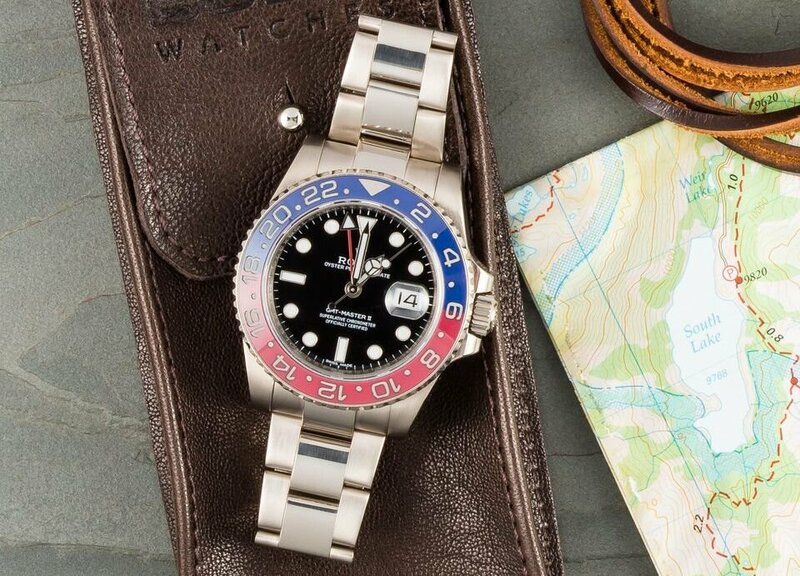 In addition to being a watch that celebs like to have in their personal collection, the Rolex GMT-Master Pepsi is an on-screen star too. 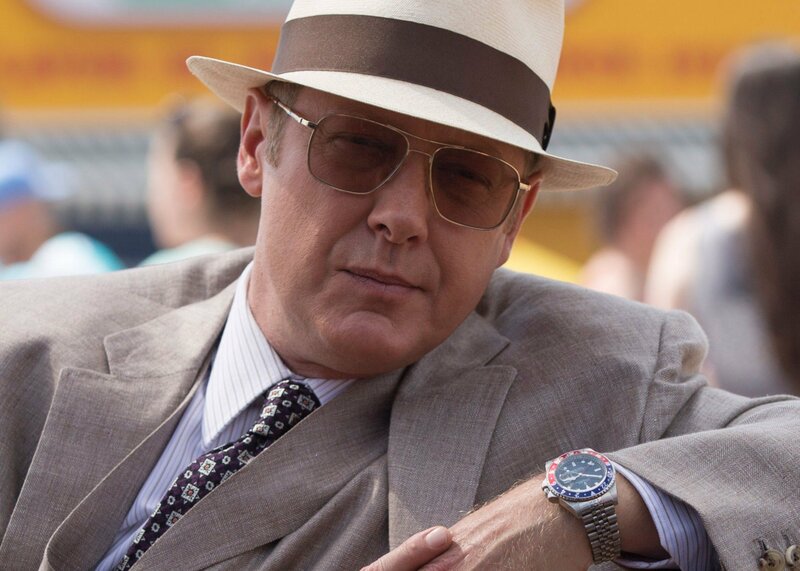 For example, James Spader’s character, Raymond “Red” Reddington wears one on a Jubilee bracelet in NBC’s show Blacklist. 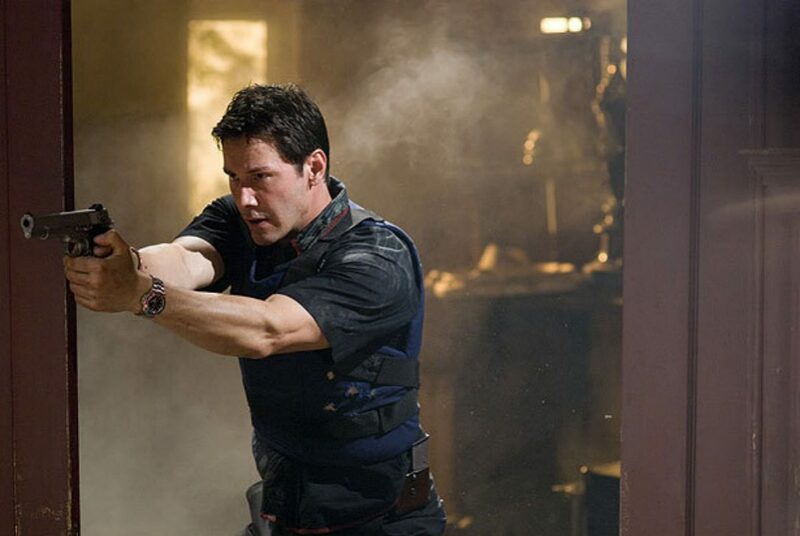 Also, in the 2014 movie, Gone Girl, Nick Dunne, played by Ben Affleck, is seen with a GMT-Master II Pepsi on his wrist. There’s also Keanu Reeves in Street Kings, Dustin Hoffman in Marathon Man, Mel Gibson in Air America, and countless others. Tom Selleck is perhaps Hollywood’s most loyal fan of the Rolex GMT-Master Pepsi. He has been wearing his on screen since he starred in Magnum, P.I. in the 1980s and continues to do so on the television adaptations of the Jesse Stone detective novels. 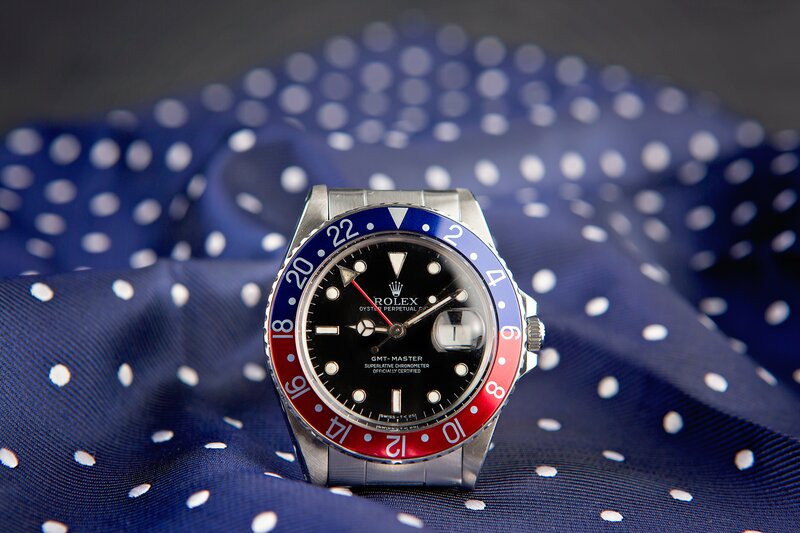 As demonstrated by its global popularity, the Rolex GMT-Master with the Pepsi bezel is an icon in its own right. With over 60 years of history behind it, this Rolex sports watch will continue to be one of the brand’s most sought after models for a long time. The only thing that’ll make the Rolex Pepsi’s story even better would be a new steel version to join the white gold one! Now wouldn’t that be something? Which celebs have you seen wearing the Rolex GMT-Master Pepsi? Have you caught it in any films or movies that we haven’t mentioned here? Let us know in the comments below!